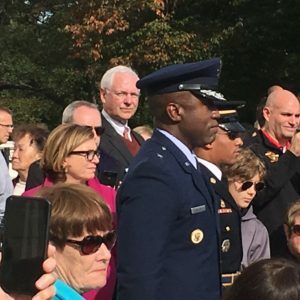 As Vice President of the White House Fellows alumni group, Geoff was responsible for planning their recent Annual Leadership Conference, which included a special tour of Arlington National Cemetery on October 28th. Pictured here, Geoff watches as Brigadier General Stacy Hawkins, from the Fellows class of 2007-08, prepares to lay a wreath during the changing of the guard at the Tomb of the Unknown Soldier. Get the highlights of the conference.